On stage with my son, summer 2014. So is the electric guitar on life support? If is it only mostly dead, is there a modern-day Miracle Max who can bring it back to life? Is the electric guitar our only hope of rescuing the Princess Bride (contemporary pop music) from the Prince HumperDMX drum machine and the six-fingered DJ Count Rugen? Or would we be more merciful to call in hospice and allow this “abomination” (according to Andre Segovia) to pass in peace? The March 22 broadcast, How Safe Is Your Job, immediately caught my attention by shining a spotlight on what economists refer to as “creative destruction,” whereby new industries and jobs replace old ones. It opens with a story from the late 19th and early 20th centuries, when the piano ruled over home entertainment. This period of prosperity led to an increase in disposable income, and many Americans purchased new pianos. Hundreds of piano makers sprang up. At its peak in 1905, the industry produced 400,000 instruments. Having a piano in your living room, and a friend or family member who could play it, was a means of cultural status. The Great Depression drove yet another nail into the piano’s coffin. (Freakonomics sidenote: following WWII, the Steinway piano company took to manufacturing caskets to shore up declining revenues. “Talk about a dying industry.” Ba-dum-tis.) Piano sales continued their decline in the decades that followed. In 2013 only about 32,000 pianos were manufactured. Is the electric guitar doomed to follow in Steinway’s footsteps? If so, would it be all that bad? When George Gruhn opened his guitar store in the early 1970s, young players were inspired by the likes of Eric Clapton, Jeff Beck, Jimi Hendrix, Carlos Santana, and Jimmy Page. As these icons step aside, Gruhn is concerned that there are no up-and-comers to fill the void. I’m sure Mr. Gruhn knows what he’s talking about. But my guitar heroes weren’t the virtuosos. They were John Lennon, George Harrison, Keith Richards. Good players, but not gods. 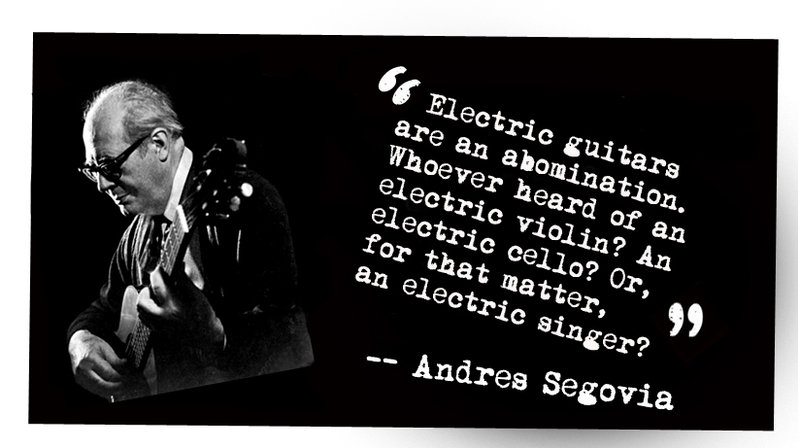 And they weren’t just electric players. Much of the Beatles’ and Stones’ music features the acoustic guitar quite prominently. John Denver was another early influencer, along with Glenn Frey and, of course, Elvis. They all made guitar look cool because, as my son said, it is. However. Cool is in the eye of the beholder. Today’s youth do not need guitar heroes. Like Delson says, they need musical heroes. Fifty years ago, musical heroes just happened to play guitar. A hundred years ago, they were playing piano. Then technology disrupted the keyboard; now it is disrupting the fingerboard. Creative destruction strikes again. There is nothing new under the sun. The heyday of the electric guitar may have come and gone, but it’s not dead yet. Neither is the piano. Rather than bemoan the decline, let’s take heart in humanity’s resilience. The radio and phonograph may have unseated the will to practice and perform on piano. But fifty years later, that same technology cultivated a whole new crop of creativity. Who knows what’s next? Whatever it is, even if I cannot comprehend the harvest, I hope I can summon the strength to applaud. John! i just saw a picture of him. i don’t know if he said this but it read, “every song ends, but is that any reason not to enjoy the music?” great article. miss u guys. Thanks for reading… miss you too!